Personalized care that is convenient, affordable and flexible to your unique health care needs. Welcome to Home Health Alliance, Inc.
Home Health Alliance, Inc. firmly believes in improved health for the client at home and that this can be achieved with excellent quality services by nursing, therapy, and medical social work professionals. Our agency maintains competitive rates of compensation for the staff. We emphasize not only the well-being of both the family and the staff but also restoring the personalized services missing from many huge agencies. Home Health Alliance, Inc. believes in the value of our staff employees and their contributions in any way in helping the company achieve its overall mission. 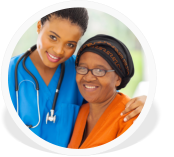 Home Health Alliance, Inc. is focused on meeting its mission to provide comprehensive high quality home health care in our areas of service and to promote community welfare along this very vital aspect of life.